A coterie of stars have gathered for the upcoming period epic Namhansanseong Fortress, from Silenced (2011) director HWANG Dong-hyuk. 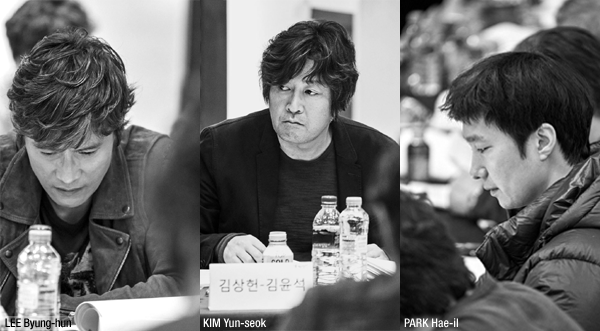 Headlining the project will be actors LEE Byung-hun, KIM Yun-seok and PARK Hae-il. Set in 1636, when the Qing Dynasty attacked the Joseon, the film focuses on King Injo (played by PARK Hae-il) and his retainers, who are hustled within the fortress located in Namhansanseong, now a UNESCO World Heritage Site. One of his retainers (LEE Byung-hun) advocates for negotiations with the attacking force while another (KIM Yun-seok) urges the king to keep on fighting. The film is based on a novel of the same name by KIM Hoon which was published in 2007. LEE has had a busy schedule recently, moving from last year’s hit Inside Men to roles in KIM Jee-woon’s The Age of Shadows and the Hollywood western The Magnificent Seven this fall, and the action-thriller Master due out next month. He will also be seen alongside KONG Hyo-jin in Warner Bros.’ second Korean title Single Rider early next year. Following the exorcism hit The Priests last fall, KIM will be seen next month in the romantic drama Will You Be There? while PARK recently featured in the successful Colonial Era drama The Last Princess alongside SON Ye-jin. Co-starring in the film will be KO Soo of The Front Line (2011) and PARK Hee-soon of The Suspect (2013). Director HWANG, who debuted with My Father in 2007, last made the hit Lunar New Year family comedy Miss Granny in 2014. Among the behind-the-scenes crew of the film will be the A Bittersweet Life (2005) and The Age of Shadows cinematographer KIM Jee-yong. Filming for Namhansanseong Fortress kicked off on November 21st with a release expected to follow at some point in 2017. CJ Entertainment will both finance and distribute the picture.